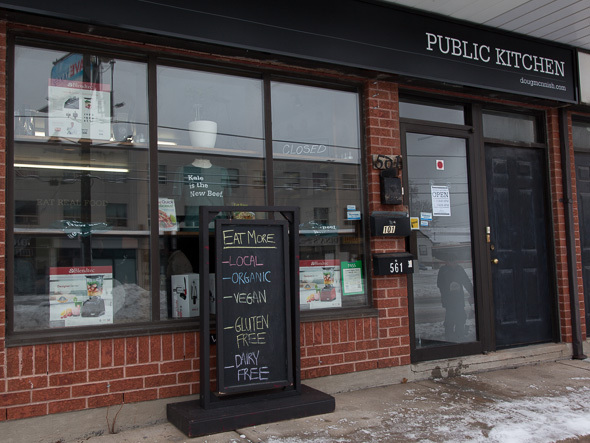 Doug's Public Kitchen has a simple mission: to make vegan (and gluten free and organic food) comfortable, nourishing and mainstream. That's right carnivores, Doug McNish is on a mission to convert you, and his new spot on Marlee (taking over for the now closed Scratch Fresh Foods) is part restaurant, part takeaway shop and part learning kitchen. 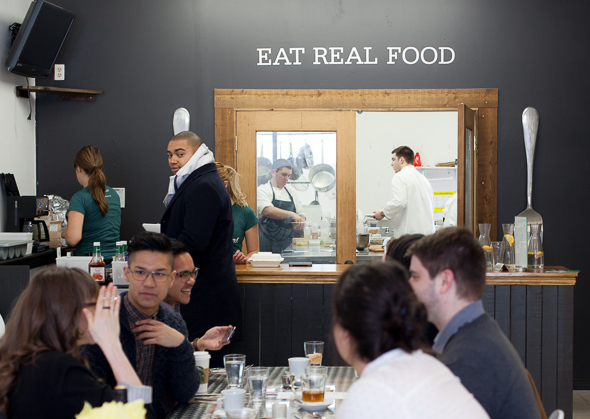 Doug has a huge following in Toronto, with popups at the Brick Works every Saturday and two cookbooks out, so vegan food is not just a job for him so much as a quest, and judging by the crowds there for Sunday brunch, his reach is evangelical. Full disclosure: I'm a flesh eating carnivore. I rarely make it two hours without ingesting some part of an animal. The word vegan is usually followed by a pffft in my presence. But Doug's restaurant promised hearty food that would not only satisfy, but nurture and sustain, so I was keen to see how it stacked up. Coffee was the first obstacle. 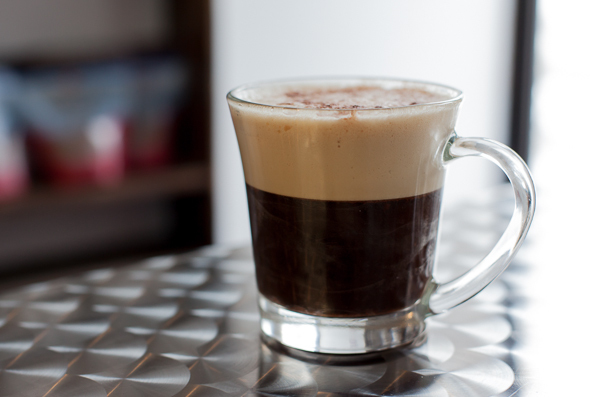 Double double (fair trade) coffee ($3) comes in the form of coconut sugar and hemp milk. Not decidedly bad, but not the same. Hemp milk just doesn't dissolve like 10% buttery cream. Aromatic and addictive Hot Chicory ($6) is a better bet, with roasted chicory, dandelion and waft-worthy cinnamon and vanilla. Mini bowls of popcorn are a great replacement for the usual bread basket. Smoothies come in mega sized 16 ounce portions and would make suitable meal replacements. The Body Builder ($10) consists of coconut water, hemp seeds, and hemp protein powder and l glutamine. 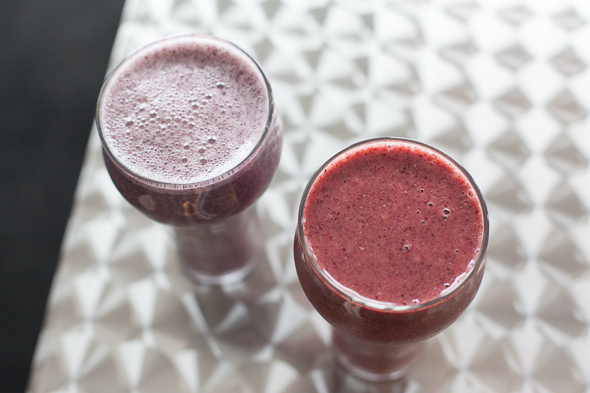 The Berry ($10) smoothie lives up to its name and not much else, with berries, bananas and mangos. There's an add-on list of proteins, berries and seeds starting at a buck a pop. Sensing I may need to stop for an emergency cheeseburger on the way home, I was surprised to find the Scramble Platter ($16) incredibly hearty and resembling something I would actually eat. Scrambled tofu fills in for the eggs, with caramelized onions, mushrooms and peppers adding some filler. A side bowl of black bean chili tastes suspiciously meaty (but isn`t). The accompanying toast and sunflower seed miso butter is even better than the real thing. 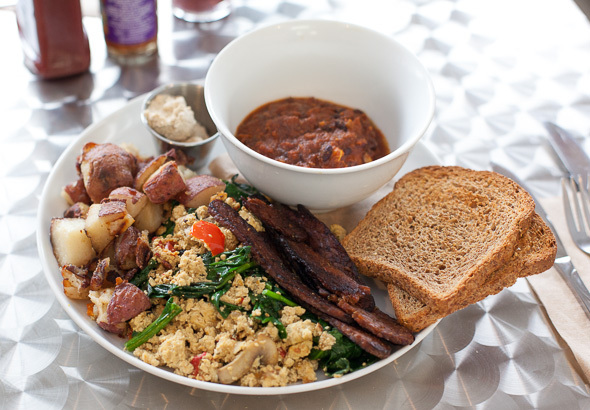 A generous portion of home fries and tempeh bacon is almost overkill; the portion is massive. 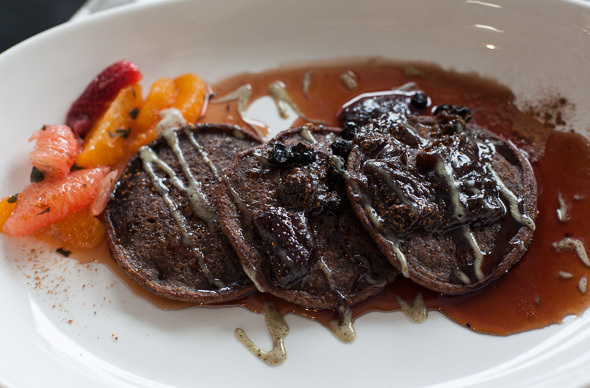 Chocolate Buckwheat Pancakes ($15) come soaked in the good stuff, maple syrup and chocolate sauce. Citrus and mint fruit salad breaks up the sweetness. The Vegan Benedict ($17) came disguised as a sesame crusted tofu (egg), with slow roasted tomato, white wine and garlic sautĂŠed spinach on a gluten free English muffin. Coconut Oil, brown rice flour, white wine, lemon juice and Dijon mustard make a mean fake hollandaise. Sorcery and witchcraft aside, Doug`s mantra `Good food isn`t cheap, and cheap food isn`t good' is on full display here. His prices are on the steep side, but when you factor in that it's all organic and typically local, and the portions are gigantic, you can imagine how high his food costs are. 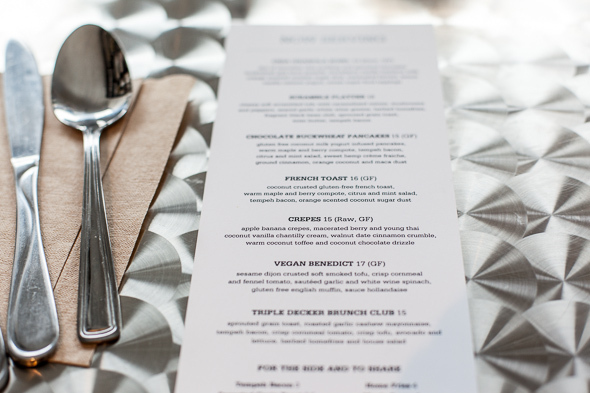 Doug's Public Kitchen is currently open from Wednesday to Saturday from 11am-6pm for grab-and-go options, and Sundays for brunch, which he welcomes reservations for. Check his website for the occasional pop up dinner and in March for his organic vegan Japanese night.